Global Disaster Recovery-as-a-Service Market 2014-2018 but where is Power and Temperature Control Rental ? I’m very happy to see this article Global Disaster Recovery-as-a-Service Market 2014-2018 and take away that the market is growing. As bigger more powerful storms seem to be happening and people in general are worried about recovering from the things that they can’t control. The story starts off with this below but there is still no mention of Power and Temperature Control Rentals, you can rent everything else but why does this basic topic get zero milage still? TechNavio’s analysts forecast the Global Disaster Recovery-as-a-Service market to grow at a CAGR of 54.64 percent over the period 2014-2018. One of the key factors contributing to this market growth is the increasing need for flexibility of cloud-based disaster recovery services. The Global Disaster Recovery-as-a-Service market has also been witnessing the demand for hybrid cloud disaster recovery services from SMEs. However, the lack of proper checks on backup data due to increasing dependence on cloud computing could pose a challenge to the growth of this market. I looked through most of the report and I find myself still scratching my head going – why are people forgetting the basics? As with many of the articles I read there is no mention of basic Power and Temperature Control Rental back-up – why is that? I get that portable rental generators are not glamorous and when you look at the Power and Temperature Control Rental market in the US on a whole, it’s pretty darn small compared to the data continuity and recovery markets – a pimple as my father would say! 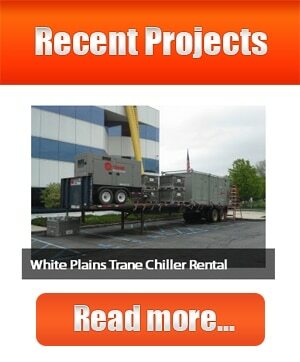 Forget about rental chillers most people probably 90% of the people in data industries that these articles are written for don’t even know what a chiller is or does or that you can get rental chillers if something fails. Having all your data stored off site, in a cloud at a server farm with N+2 generator sets and 14 days of fuel plus 3 times the cooling capacity needed to kept all the servers running is great BUT only if you have a place for the people to relocate to????? If you are in the NY, NJ, CT area you remember Sandy and should remember past storms that missed the coast but came through the PA Valley. How crippling were they? Forget the winds, the flooding caused more damage, power lines go back up quickly – flooded substations do not! Even after power comes on how many of you didn’t have heating or AC? This is what Paratus Rentals prepares you for the physical aftermath of the storm and Paratus gives you the ability to get your physical property back up and operating quickly because having the data is wonderful but having somewhere for people to use the data in is much better! Contingency planning has rules to follow? Paratus is rewriting some of those rules!